With the recent reports of freezing temperatures in Florida and in Texas you must be ready to keep your eyes open for citrus arriving with possible freezing injury. 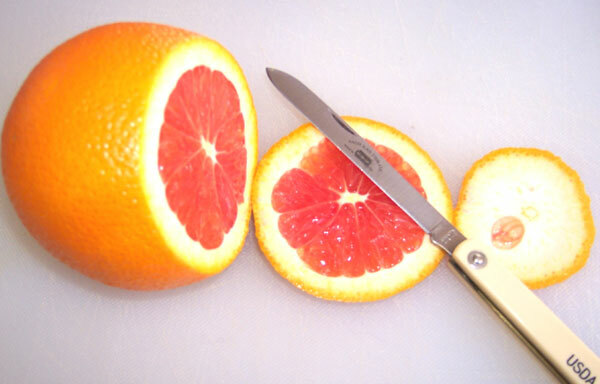 It is impossible to detect externally, meaning you must be ready to cut some citrus to find any problems. After a few weeks the watersoaked portions will dry out, as the juice sacs collapse having been emptied of juice. 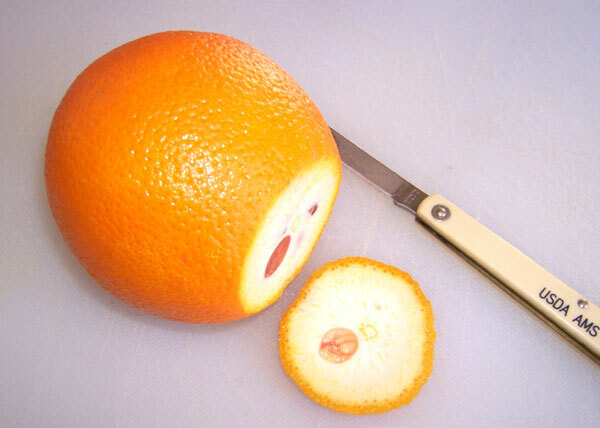 As shown in the image above of this cara cara orange, you will make a preliminary cut on the orange , cutting enough of the rind at the stem end to just expose the flesh. The next step is to cut a slice about 1/4 in width. This segment is allowed to be totally dry or mushy from the freezing injury. But if this entire segment is affected, and the mushy or dry condition extends into the remaining portion of fruit, the fruit is considered as being damage, a defect. This defect is considered a quality defect and is scored against the 10% tolerance. The most important question everyone asks is, how much do you have to cut? As you can see the USDA has developed a cutting plan for their inspectors. The USDA recommends cutting a minimum of 10 fruit if freezing injury is suspected. For example, if after cutting 10 oranges the inspector finds at least orange with a scoreable defect, from freezing injury, the inspector must cut all remaining fruit in that sample. They must continue with this procedure for all their samples they inspect. 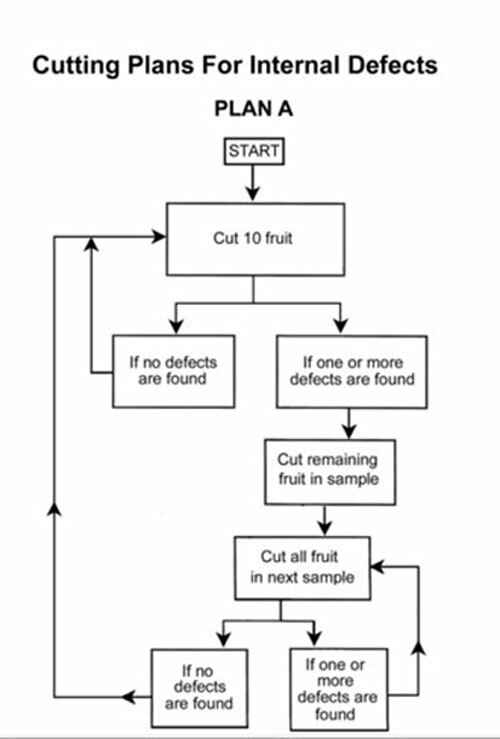 If you would like to deviate from this procedure I think it would be safe to cut 3-5 fruit per sample, and if a defect is found, cut 20 fruit in your sample. Doing this for 3 samples would give you a good estimate of the percentage of citrus with freezing injury. A diagonal cut would be useful to determine the extent (how far into the fruit)the freezing injury affects the fruit, but it has no bearing on how the affected fruit would be scored as damage or as serious damage. The USDA inspectors are trained to make stem cuts only.